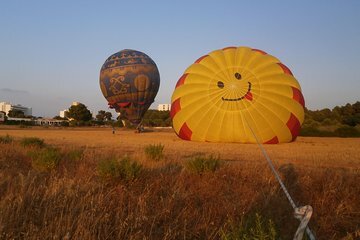 Soar over the scenic sprawl of northeast Mallorca during an exhilarating 2-hour hot-air balloon experience. Ascend to the air from Cala Milor and feel your excitement heighten as you take to the skies and see blissful beaches and verdant beauty from a unique perspective. Gaze at panoramic vistas of the idyllic island throughout your 2-hour ride then return to the ground to toast your flight with a glass of lavish Champagne. Select from a morning or afternoon departure to suit your schedule, then either make your own way to Cala Milor. Enjoy the scenic countryside as you venture to the launch site of your hot-air balloon. On arrival, greet your host and listen to a comprehensive safety briefing. Step inside the balloon’s sturdy basket and feel your adrenaline surge as the gas flame inflates the brightly colored balloon. Capture aerial views of the beautiful island as you sail high into the sky; see the lush landscape and shimmering sea from above and listen as your guide offers insight into the island’s geology. After your fabulous flight, land smoothly on dry land then head inside the launch center to celebrate your ride with a glass of sparkling Champagne. It was a wonderful experience I would advised everyone to have a go if one had a chance. It is just wonderful. well organised, great pilot, and an amazing experience, highly recommended.